Posted: July 18, 2013 in Shared Thoughts, Study! When a person experiences their initial awakening that God exists, it is often accompanied with the realization His presence is indiscernible to them. Therefore, if a person is to truly “come to God,” it would require not only the belief that God “is,” but also a realization that He is somewhere they are not. A true awareness of “God is” comes with mindfulness that there are two distinctly different settings, where they are and that obvious elsewhere wherever God might be, seemingly afar off. The now awakened consciousness recognizes that if any genuine connection is to be established so that a relationship with God might be formed and nurtured, then somehow the expanse between them both must be closed. But not knowing where God is also leaves one with not knowing how to come to God, even if somehow alone he could close the expanse. And so the author of Hebrews makes it irrefutable through the whole of the verse; without faith one cannot please God, nor can they come to God. The way to God can only be traveled by faith and the purpose of faith is to come, but who will come if they don’t at least believe He is? Therefore the verse clarifies that any progress one experiences in “coming to God” is only the reward for their hearing the Gospel and seeking Him diligently. Just because His presence may not be discernible, God is not lost. However the Gospel must be preached if men are to be made aware of the absence of His presence in order to compel them to seek after Him, if haply they should find Him. Contrary to the absurdity of God being lost, when one truly begins to awaken spiritually, it is because they’ve realized without God’s presence they are alone and the ones who are lost. It is like the confident child who while playing wandered off from the security and comfort of their parent’s company. When suddenly they notice they’re all alone with no idea where their parents are. Suddenly they recognize they are lost and their parents will not be pleased; because the child knows they’re supposed to be next to their parents. Accordingly the journey by faith of coming to God must begin with this basic understanding; I am lost and not where I am supposed to be. The creature having wandered off from his Creator can no longer discern where God is or even which direction to run to find their way back to Him. Sadly, there are many who have wandered so far off pursuing their own thing or have been preoccupied with trying to stay up with others, going blindly through life, that now they agonize or are filled with doubt if there even is a Creator. This is a dreadful state to be in, to be dispirited by the knowledge you’re lost, or worse to not even know it. Can you imagine a child looking up and not seeing their parent and begin to rationalize that since they cannot see them that their parent therefore was never real? 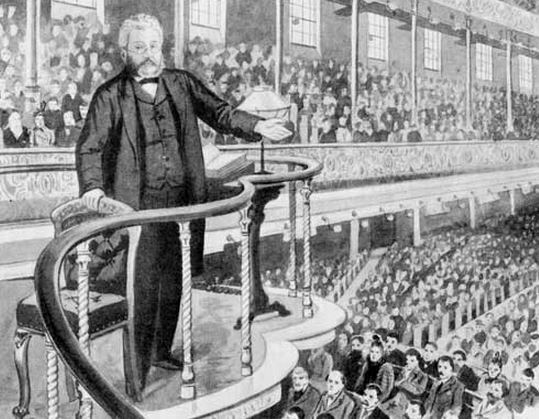 This is a sermon reading by a gentleman that delivers this sermon in amazing similarity which one would expect Charles Spurgeon to have delivered it himself. Close your eyes and you can easily imagine yourself being there at the Metropolitan Tabernacle before the Prince of Preachers as he would have passionately reasoned with his congregations the depths of this great passage. It is this yearning that spurred the Apostle ever forward through the various trials of being beaten with rods, once was stoned, three times suffering shipwreck, a night and a day stranded in deep open waters, in hazards of robbers, in perils his own countrymen, constant threats from the heathen, suffering often weariness and painfulness, through many a sleepless night often in hunger and thirst, often when exposed to cold and nakedness, frequently giving himself to times of long fastings in yearning desire for even more . . .
More what? Why was Paul willing to endure such? What was it that drove him continually forward through such hazards with unfaltering determination? Philippians 3:8 Yea doubtless, and I count all things but loss for the excellency of the knowledge of Christ Jesus my Lord: for whom I have suffered the loss of all things, and do count them but dung, that I may win Christ, 9 And be found in him, not having mine own righteousness, which is of the law, but that which is through the faith of Christ, the righteousness which is of God by faith: 10 That I may know Him, and the power of His resurrection, and the fellowship of His sufferings, being made conformable unto His death; 11 If by any means I might attain unto the resurrection of the dead. Posted: July 4, 2013 in Shared Thoughts, Wake Up! Coming to the place of heart resolve or maturity in Christ of having no spot, blemish or anything intentionally hidden, subjecting both heart and life continually to a thorough washing of the water of God’s word. Forsaking the distracting cares and pleasures which hinders a believer from fully coming out of the world in earnest and wholehearted pursuit of the promises of God. Having our lives wholly transformed by the renewing of our minds, forsaking our lives for the governing life of Christ within us. Walking with daily awareness of the need to be holy and perfecting holiness in the godly fear of the Lord. Drawing ever closer into a deeper intimate relationship with God, as Paul said, “That I might know Him.” A true believer knows he has only tasted of the Lord and has as yet only received as earnest a portion of the Spirit of Christ. Living with the aspiration to please God and receiving the reward of our faith, daily fellowship with Christ. For the purpose of this article, I am only going to touch on the first part of the three divisions that the translators distinguished by their insertion of commas. My intention is to follow-up with at least one more, if not two articles, using this outline. (3) God is a rewarder of those who diligently seek Him. The simplicity of the whole verse tells us that through faith we can please God by coming to Him and receiving the reward He has for those who have ears to hear. Ultimately, the true reward of the faithful is not found in their inheriting a long list of trophies that fills up their treasures in heaven. Greater than such treasures will be the completion of faith’s journey which carries us from this life of “coming to God,” to seeing Him face to face and not being consumed by the brightness of His glory, fully immersed in the reality of being made one with Him.